Charles-François Daubigny (1817–1878), Landscape with a Sunlit Stream (c 1877), oil on canvas, 63.8 x 47.9 cm, Metropolitan Museum of Art, New York, NY. Wikimedia Commons. Two hundred years ago today, Charles-François Daubigny was born in Paris. My previous article traced his career up to 1863, and showed a small selection of his paintings. This article concludes that account. In 1865, Daubigny visited London, where he had lunch with Whistler. Back in France, he continued painting his superb and highly innovative river landscapes in the Île de France, the countryside around Paris, which he knew from his childhood. Charles-François Daubigny (1817–1878), Boats on the Oise (1865), oil on panel, 36 x 67 cm, Musée du Louvre, Paris. Wikimedia Commons. Working on the bank or in his floating studio, paintings such as his Boats on the Oise (1865) were generally well-received, although there were still critics who complained about his lack of Salon finish. 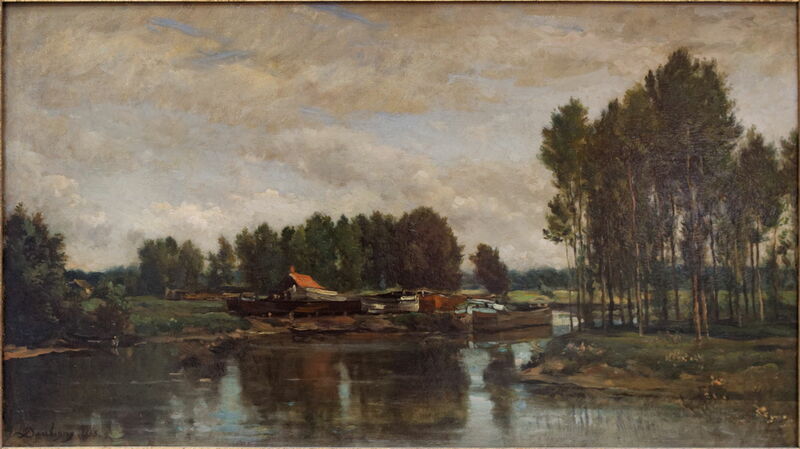 Charles-François Daubigny (1817–1878), Les péniches (Barges) (1865), oil on panel, 38 × 67 cm, Musée du Louvre, Paris. Wikimedia Commons. 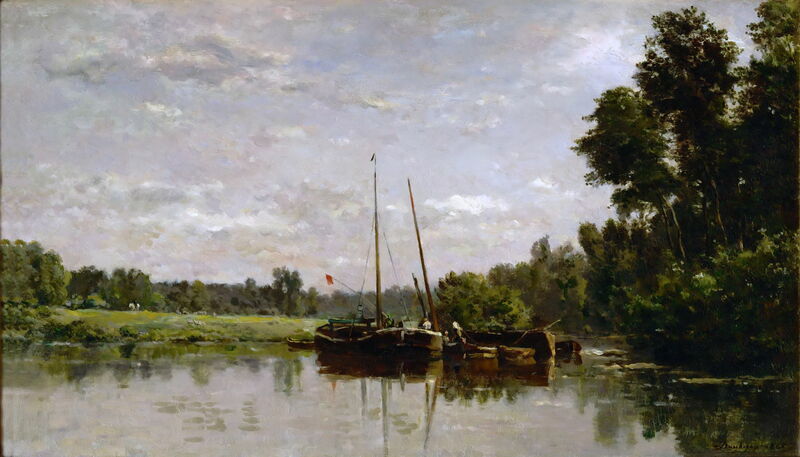 Les péniches (Barges) (1865) is another of these now well-known works, which were so influential on the mainstream Impressionists, who were just starting their careers. 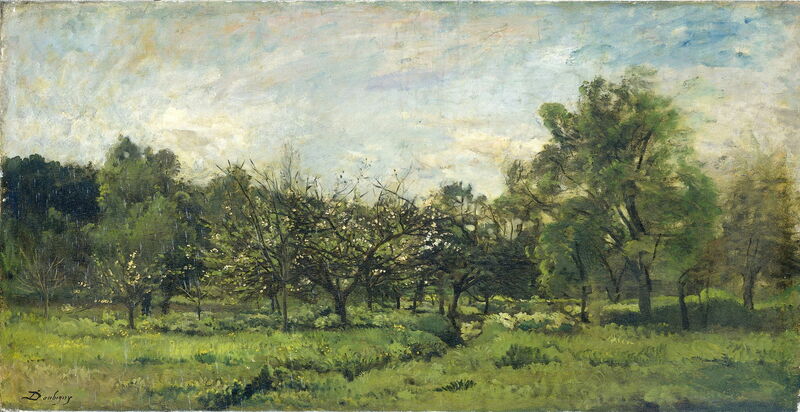 Charles-François Daubigny (1817–1878), Orchard (1865-69), oil on canvas, 55 × 107.5 cm, Rijksmuseum Amsterdam, Amsterdam. Wikimedia Commons. Orchard (1865-69) is a fine example of his pioneering paintings of fruit trees in blossom, long before Japonisme became popular in Europe. Daubigny met Monet near Honfleur by 1866. In 1866, Daubigny was elected to the jury for the Paris Salon. He was there able to defend the submitted paintings of Impressionists, including Pissarro, Renoir, and Cézanne. The following year he signed Bazille’s petition to hold a second Salon de Refusés, and in 1868 was able to persuade the jury to accept paintings from seven of the mainstream Impressionists. However, in 1870 he resigned from the jury when it decided to reject a painting by Monet. It was in 1868 that the term impression seems to have been first applied to Daubigny’s landscapes, when Odilon Redon referred to Daubigny as “the painter of a moment, of an impression”, although it was not until later that Monet applied the term to one of his own paintings, Impression: Sunrise (1873), shown at the First Impressionist Exhibition in 1874. The Franco-Prussian War in 1870 drove Daubigny to flee to Britain with his family. While there, Daubigny introduced Monet and Pissarro (who had also fled to London at the time) to Paul Durand-Ruel, who was Daubigny’s dealer and had just opened a gallery in London. Daubigny co-arranged in London an exhibition of paintings which included some of Monet’s. These relationships with Durand-Ruel were to prove decisive in Monet’s and Pissarro’s careers. In 1871, Daubigny exhibited nine paintings at the International Exhibition in London. After that and the end of the Paris Commune, he and his family returned to France, where he resumed painting from his floating studio. Charles-François Daubigny (1817–1878), Banks of the Oise (date not known), oil on canvas, 43 × 61 cm, Museu Mariano Procópio, Minas Gerais, Brazil. Wikimedia Commons. 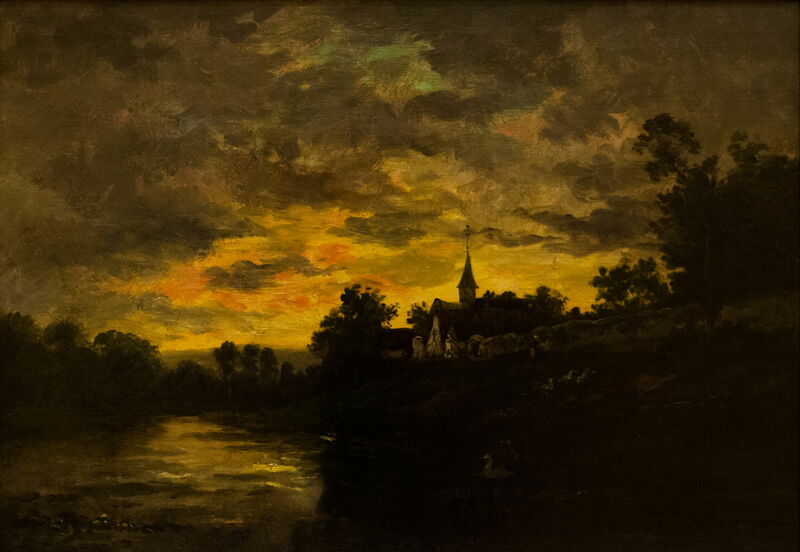 During the 1870s, Daubigny painted an experimental series of twenty-five moonlit landscapes, among them Banks of the Oise (date not known), which explored the chromatic effects of light. 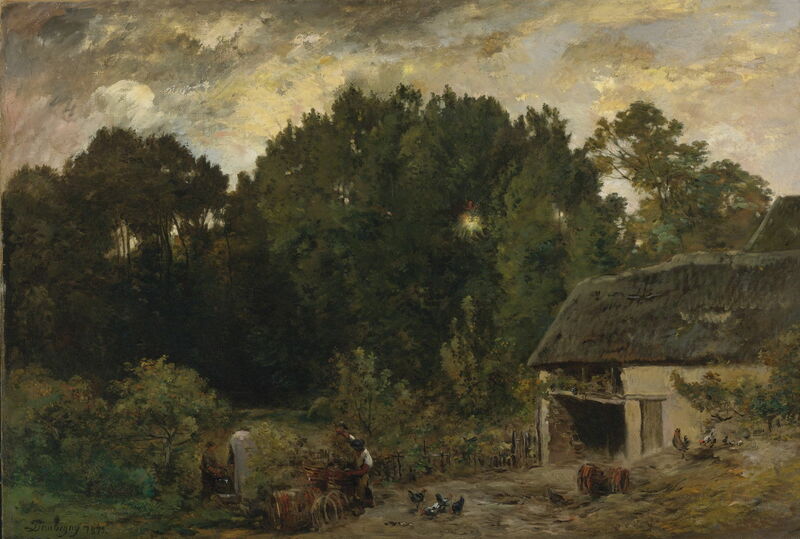 Charles-François Daubigny (1817–1878), Le Tonnelier (The Cooper) (1872), oil on canvas, 114.3 × 167.6 cm, Private collection. Wikimedia Commons. Le Tonnelier (The Cooper) (1872) shows the increasing looseness in Daubigny’s skies. Charles-François Daubigny (1817–1878), Farm at Kerity, Brittany (date not known), oil on canvas, 64 x 101 cm, Gemeentemuseum Den Haag, The Hague, The Netherlands. Wikimedia Commons. 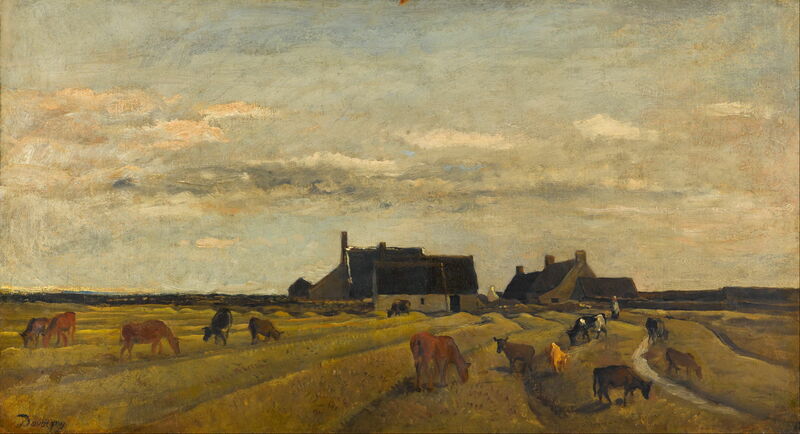 Although undated, this painting of a Farm at Kerity, Brittany continued the transition to the Impressionist palette. Charles-François Daubigny (1817–1878), October (date not known), oil on canvas, 87.5 × 160.5 cm, Rijksmuseum Amsterdam, Amsterdam. Wikimedia Commons. 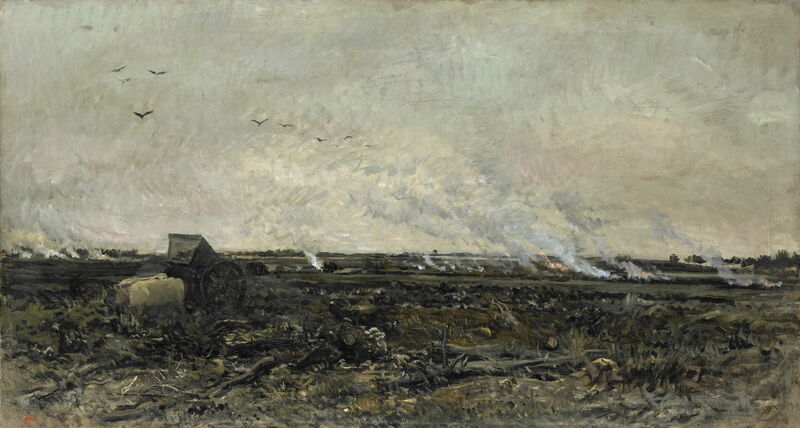 Daubigny’s undated October is an unusual and very effective portrayal of stubble-burning on a grey and windy autumn day. 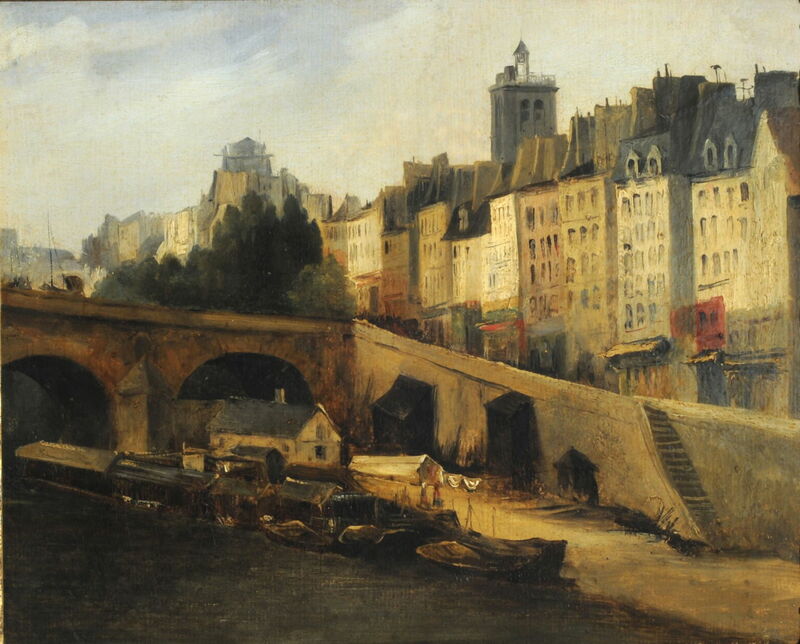 Charles-François Daubigny (1817–1878), Pont Marie (date not known), oil on canvas, 24 x 29 cm, Museo Nacional de Bellas Artes, Buenos Aires, Argentina. Wikimedia Commons. Few of Daubigny’s paintings show the city of Paris, but this undated cityscape of Pont Marie is of a thoroughly urban riverbank. Charles-François Daubigny (1817–1878), The Coming Storm; Early Spring (1874), oil on panel, 44.4 x 69.4 cm, Walters Art Museum, Baltimore, MD. Wikimedia Commons. By the time of the First Impressionist Exhibition in 1874, when Daubigny was 57, his landscapes had become very painterly indeed. The Coming Storm; Early Spring (1874) is a good example. 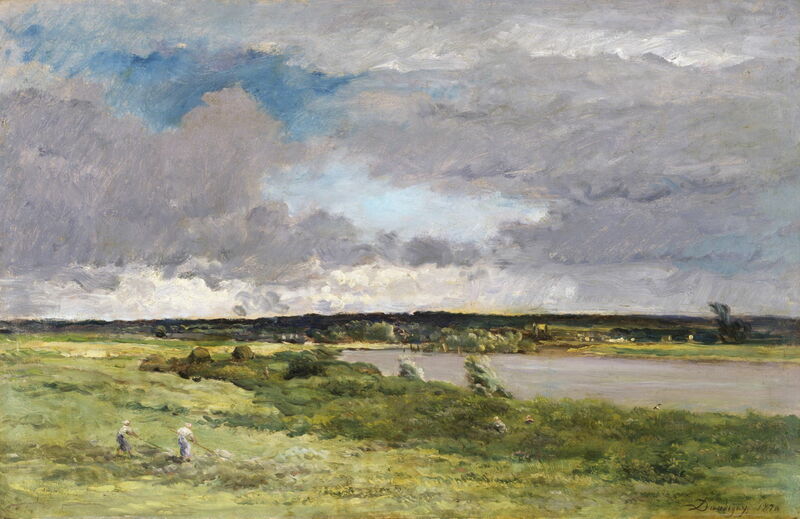 Charles-François Daubigny (1817–1878), Fields in the Month of June (1874), oil on canvas, 135 x 224 cm, Herbert F. Johnson Museum of Art, Cornell University, Ithaca, NY. Wikimedia Commons. 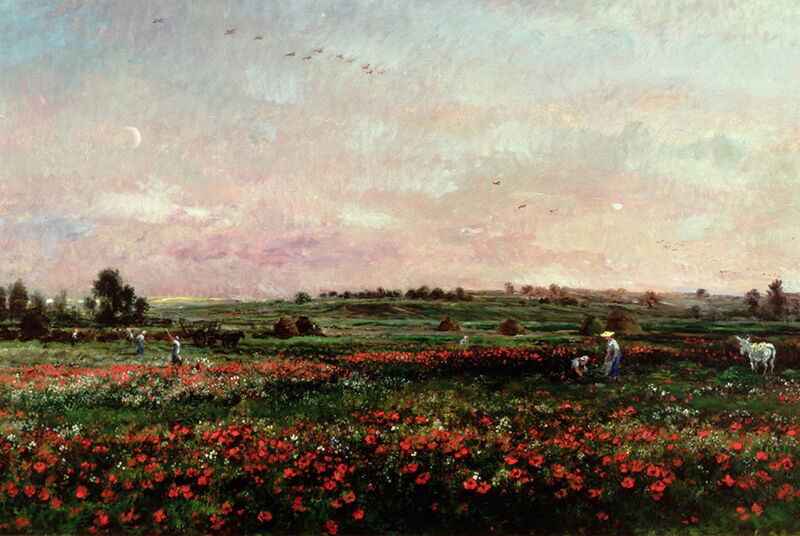 Daubigny was an innovator in his depiction of what was later a popular motif for the mainstream Impressionists: fields of flowers, particularly poppies. He painted Fields in the Month of June in 1874, which compares with Monet and de Nittis in 1881, and Vincent van Gogh in 1890. When van Gogh was working for Goupil in 1874, he compiled a list of his favourite artists, which included Daubigny. And it was in Auvers-sur-Oise, the village which still contained Daubigny’s former house and studio, that van Gogh spent the last two months of his life, in 1890. Far from becoming staid or repetitive, the final years of Daubigny’s career and life saw him pressing on to explore the transient effects of light. 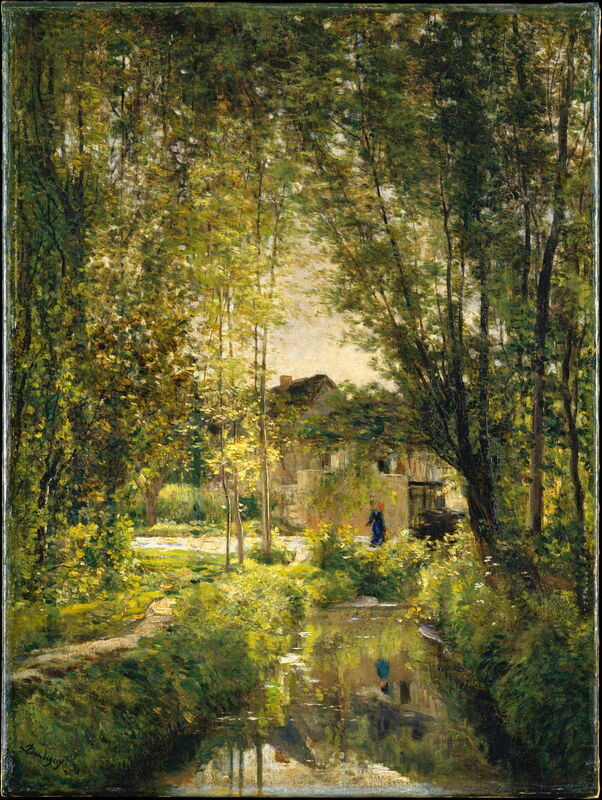 Landscape with a Sunlit Stream (c 1877) retains a lot of detail, but in its light and colour is gloriously Impressionist. 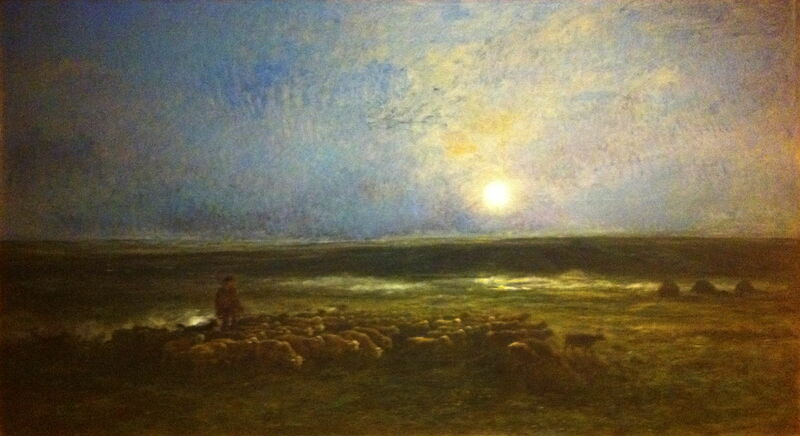 I think that this is another of Daubigny’s great masterpieces. Moonrise at Auvers (1877-78) is the culmination of his experimental nocturnes, another masterpiece in its own right, and the last painting which he completed. Daubigny’s health had started to deteriorate in 1875, the year that his great friend Corot died. By this time, he was suffering from gout, asthma, and chronic bronchitis. These worsened each year, and constrained his painting. He was still able to work in his floating studio during the summer of 1877, but had to cancel plans to do so when it was colder. He died in Paris on 19 February 1878, having just attained the age of 61. His work was not quickly forgotten, and its influence on the mainstream Impressionists and Vincent van Gogh was acknowledged. However, as the mainstream Impressionists became first better accepted and then very popular later in the century, Daubigny’s work faded into the pre-Impressionist past. When the history of Impressionism was repeatedly revised and re-shaped during the twentieth century, Daubigny and his innovative paintings were forgotten. It is time to remember him not just as a major landscape painter, but as the first of the Impressionists. Ambrosini, Lynne et al. (2016) Inspiring Impressionism: Daubigny, Monet, van Gogh, National Galleries of Scotland. ISBN 978 1 906270 86 5. Posted in General, Painting and tagged Corot, Daubigny, Durand-Ruel, history of painting, Impressionism, landscape, Monet, painting, Pissarro, van Gogh, Whistler. Bookmark the permalink. A fascinating introduction to intersting and important paintings.